We often hear, “When can I stop using treats?” Our reply might vary a little but usually is followed by, “Do you go to your job and work for free?” Exactly, it seems absolutely crazy to think that we would work our hands to the bone for a smile and nod from our boss. The same thing goes for your four-legged friend they too need a reason to work. So ditch thinking of food as a treat or bribe and start thinking of it as a paycheck. If they do the right work, they get the appropriate pay, if they do outstanding work, they should get that holiday bonus as well. By having meals at specific times you can ditch the doggy buffet line and start seeing improvements in your dog’s life overall. If you leave food in your dog’s bowl all day, why would they ever have a reason to hang out with you? All dogs need to survive is food and water and the proof is in the wild. Have you ever seen a wild dog look to a human for a toss of the ball or a scratch behind the ears? Wild dogs became domesticated by feeding off the leftovers from our ancestors. Establishing a feeding schedule could literally be life and death for your dog. If you free feed and your dog stops eating because they feel ill, how long would it take you to notice especially if the food bowl is always left down? If you’re feeding at specific times, you know exactly which meal Fluffy stopped eating and can plan a vet visit if needed. Starting regular meal times might actually raise your dog’s appetite. People with picky dogs make the mistake of leaving food down all day. And, dogs that graze are never hungry because they can eat whenever they want and know it will be there waiting. So why get excited for food when it does show up? 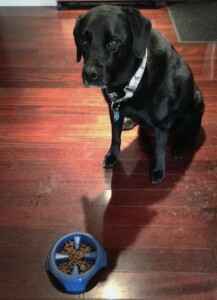 By scheduling specific meal times you know when your dog is hungry and you also know when he is full. You can even plan your classes in relation to meals; if they come to a morning class we recommend feeding less breakfast before class. If they come to an evening class we recommend feeding less dinner before coming in. Look at it this way, if your bank account is empty or near empty you’ll work harder for the next buck, so set yourself up for success and train your dog when you know they’re hungry. 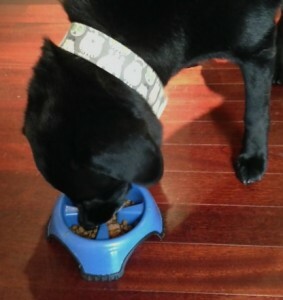 When you have set meal times you can train your dog with his kibble, no special or extravagant treats are needed. Feeding time = a great time to TRAIN! Obesity in dogs is on the rise; if you’re in control of their meals you can control their weight. Save your dog’s joints and put years on their life by keeping them slim and trim. You can do this by breaking your dog’s daily calories up into two meals, we suggest 12 hours apart but understand like humans some dogs might prefer more food at certain meal times (like dinner after a long day of work as opposed to breakfast when you’ve been sleeping, your metabolism is slowed and you’ve not started your day). The length of meal time should be set as well. We suggest a ten-minute time cap. Make a big deal when getting your dog’s food ready “Mmm… Fluffy doesn’t this smell good, it looks delicious”, put the food down and start the timer, if after 10 minutes the dog hasn’t eaten or hasn’t finished eating tell them so sad and pick up the bowl. I assure you, the next meal they will be less likely to pass up. Dogs have a natural instinct to forage. If you’ve ever noticed your dog de-stuffing a plush soft toy, they might be missing that type of work in their daily life. Ditch the traditional bowl and use a puzzle toy or slow feeding bowl to satisfy their instincts to WORK for their food and save those stuffed animals. And, if you have a shy or reactive dog set meal times paired with positive reinforcement might get you quicker behavioral results you’re hoping to see. So as you can see having set meal times can benefit every dog out there!